Dimensions in inches (LXWXD): 65.5" X 39.5" X 11"
Exciting inflatable baby pool for a fun-filled soak up time under the sun. 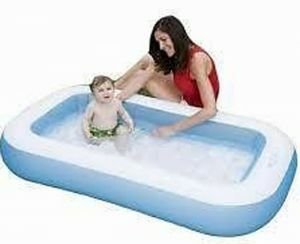 Features a rectangular shape and looks like a real pool to the children. Made of thick, durable plastic for long-lasting outdoor use. Create moments to cherish in your garden with this durable pool. Just fill in water and create your personal water park.